Photo by Sara Krulwich for The New York Times. It’s been dissected as a runaway commercial success. It’s been analyzed as an incisive commentary on current race relations. It’s even, at times, received its due as an example of complex poetry in rap. But, rather counterintuitively, relatively few trained musicians have talked about this Broadway hit as pure music in and of itself. Leaving the “music” out of discussions surrounding Hamilton: An American Musical means missing a huge chunk of the big picture, particularly when it comes to predicting the piece’s legacy. For all of the talk of its wild popularity, messages about American identity with regards to immigration, and effects on the rap world (e.g., The Hamilton Mixtape), the music’s been largely left out in the cold. Let’s change that. There’s an endless amount of music criticism that could be written about Hamilton, but to get things started, there are three aspects of quality musicianship that I often use to help analyze the possible impact and legacy of a piece of music: historical consciousness, versatility, and originality. These three elements, which I’ll define shortly, are useful because the combinations they create often make for a deeper, more enjoyable, and more thought-provoking listening experience. Music that succeeds at all three can be listened to over and over again, well after the artistic or aesthetic trends have faded. So how does Hamilton stack up? + Learn more on Soundfly: Preparing for a musical theater audition can be challenging, especially if you struggle to read music. Be ready to impress at your next callback with our course, Music Theory for Broadway Actors. Many have pointed out the lyrical references in Hamilton. Genius even conveniently made a compilation. But there are some noticeable musical ones as well. By drawing a complex web of interpenetrating, mutual connections to both predecessors and current inspirations, composers like Hamilton‘s Lin-Manuel Miranda deepen the artistic experience for their listeners by always giving them something new to discover. Whether it’s the unmistakable reference to Mobb Deep’s infamous “Shook Ones, Pt. II” (1995) in “My Shot,” or the counting and scratching that provides a reference to Notorious B.I.G.’s “Ten Crack Commandments” (1997) in “Ten Duel Commandments, Miranda is constantly inviting his listeners to position and reposition his own rap architecture within the larger, living body of the genre’s history. Musical Director Alex Lacamoire has talked about studying and trying to mimic the harmonies of Destiny’s Child in “The Schuyler Sisters,” tweaking the beats on the rap battles to sound more trap, and even including references to the Beatles in there. By referencing masters like Notorious, Havoc, and Prodigy, he displays the strength of his rap game; he and his co-stars themselves share the same references of rap greatness. When Richard Schumann chose an artist’s theme on which to write a set of variations in 1827, he didn’t pick Mozart’s evil, less talented foil, Salieri; he picked Mozart himself. In a similar way, great rappers today — and not just those writing musicals — learn from their predecessors and then repay them by updating their old works for a new age (like recreating Mobb Deep’s eerie police siren calls with violin). Musicians can sometimes get away with making albums and even long careers out of a single kind of sound. But, in order to create an oeuvre that stands the test of time, artists must display the depth of their influences by presenting them in a variety of new ways. That’s why only after Kanye West made The College Dropout and 808s & Heartbreaks did he tackle the artistic themes of Yeezus (not to mention The Life of Pablo). By doing so, he showed that rap could handle incorporating electro, noise, and high art music, in addition to the soul, R&B, and gospel he explored in his older works. Those references to “Ten Crack Commandments” and “Shook Ones, Pt. II” could have been nothing more than fun, insider references discovered with joy and surprise on a hidden Genius annotation. But, by combining his knowledge of rap’s canon with his understanding of different forms of rapping (not to mention his ultimate grasp on American political history), Miranda injected both “Ten Duel Commandments” and “My Shot,” as well as other more expansive songs like “Meet Me Inside,” with new meaning and purpose. The reality is that there is no single rap genre, but rather, a broad range of rap genres. Miranda makes use of everything from the Midwest chopper style, to Atlanta’s Auto-Tune spitting, to the Southern triplet flow, to New York’s more straightforward boom-bam duplets, to California’s extreme rhythmic trailing behind the beat and renews each one again and again with his variety of approaches. It goes without saying that Hamilton not only explores American history as its subject matter, but also tackles the unwritten history of American hip-hop as musical expression. The cabinet rap battles travel from old school hip-hop with an obvious Grandmaster Flash reference to a more synth-y modern vibe in the second one. By combining the strict singing of the first voice (Eliza), whose melody is based on pitches from a musically defined scale, with strict rapping in the duet’s second voice (Angelica), whose vocal pitches are based on a timbral or percussive scale, the Hamilton creator was able to make both the singing and the rapping far more interesting than they would have been on their own. It makes listeners appreciate the excellent, wide vocal range common in Broadway theater, since they now have something against which to compare it. Similarly, it allows listeners to appreciate the creative delivery of stage lines in a theatrical context informed by rap. While the comparison to past R&B crossovers like Ashanti and Ja Rule has been well documented, this combination of singing and rapping has strong roots planted within the rap genre as well. Listen to Lauryn Hill’s harmonizations with herself on the first two full tracks of the Fugees’ album The Score (1996), or all over her solo debut, The Miseducation of Lauryn Hill (1998). For something more recent, look no further than Chance the Rapper’s quotation of a famous gospel song in the introductory track from Kanye West’s The Life of Pablo (2016), or, to go a little further back, Young Thug splitting the semitone into microtonal steps on “Tabernacle” (2013). + Learn more on Soundfly: What made West Side Story so influential and ahead of its time? 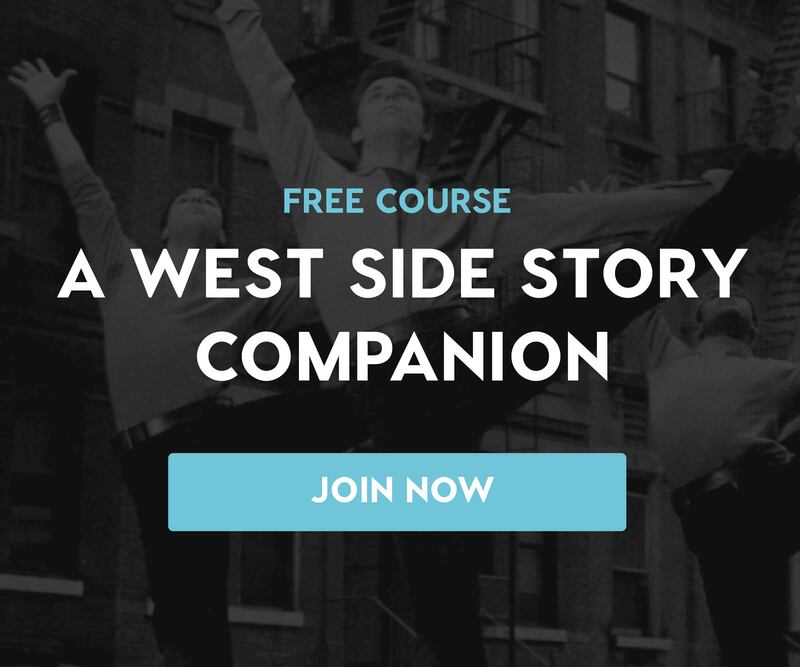 Explore our free docu-course, A West Side Story Companion, to find out! Certainly, in the format, form, success, casting decisions, and extra-musical commercialization of the musical, almost everything about Hamilton is original. How about the music, though? Here, we’re looking for something in the musical compositions themselves that we’ve never seen before in rap. One uniquely strong example of this is “Meet Me Inside.” Why? Because the song is in 7/8 time. Let’s return to Miranda’s “Meet Me Inside.” If you count the pulses in eighth notes, you’ll realize that there are only seven of them, not eight, in every bar, as most rap meters usually call for. By clearly outlining the beat’s untraditional and unbalanced 7/8 structure through aligning the stopping and starting of their own sentences with the points at which the metered bars behind them also start and stop, the Hamilton rappers have adapted the conventional four-beat, one-bar rap genre line into a 3.5-beat, one-bar line. Ultimately, the innovation here isn’t in writing lyric and phrase groupings that result in bizarre meters. Rappers often use tricky rhymes and delivery to end in twists of seven or nine or 11 beats, but those often occur in 8/8 measures, and they’ll use rests to let the beat catch up to them. “Meet Me Inside,” however, lets the time signature follow the rhythm of the sentences and stick to seven beats per measure. Of the first two melodic phrases, “Lee, do you yield” lasts for three eighth notes, while “he shot him in the side” lasts for four eighth notes. Miranda spreads two short sentences across each bar and works with the cadences and rhythms of each micro-phrase to fit it perfectly into this alternative-meter structure. In this way, Miranda balances out radical innovation with a spoonful of sugar that helps make the musical medicine go down. The creators of Hamilton show that by combining versatility with originality and historical consciousness, they created a musical work that stands up to perpetual re-listenings and they’ve got the numbers to back it up. As another New York rapper would state centuries later, “You wanna learn how to rhyme, you better learn how to add: it’s mathematics.” And it takes no mathematical whiz to know that whether assessed in musical awards, monetary profit, or audience reach, the result of Miranda + Hamilton = gazillions.